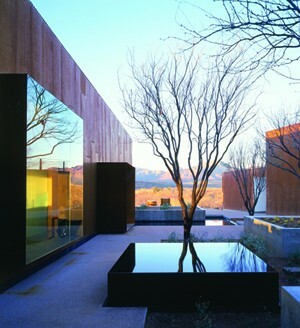 Award winning American architect Rick Joy is renowned for this climate responsive and landscape sensitive work, based mostly in the desert region of Arizona. Using a robust palette of materials, including rammed earth, hardwoods and rusted steel, Joy’s work looks as much from the earth, as sitting within it. Joy’s practice predominantly includes residential work, with Tubac House being his most celebrated. Joy’s work has been both published and exhibited widely with a group of architectural experts recently choosing a Rick Joy house as one of five most influential and inspiring homes in recent times, alongside work by Rem Koolhaas and Shigeru Ban. Rick appeared at the Eastern Avenue Auditorium, University of Sydney on Monday 19th July 2010 and at the BMW Edge, Federation Square, Melbourne on Thursday 22nd July 2010. The Melbourne talk was presented in association with Architectural Review Australia. Rick will be talking at the Eastern Avenue Auditorium, University of Sydney on Monday 19th July 2010 and at the BMW Edge, Federation Square, Melbourne on Thursday 22nd July 2010. The Melbourne talk will be presented in association with Architectural Review Australia.